Named after the second largest planet in our solar system Saturn is the big daddy of the Moon bouldering mat family with unbeatable performance. It measures 160 x 120 x 14 cm and has all the same features as its smaller brother the Warrior but with a bigger and thicker landing area. A larger version of the Warrior, the Saturn is Moon's largest crash pad, designed for some serious high ball bouldering. Measuring in at 180cm x 120cm and made from a sandwich-style combo of open and closed cell foam, it has the best chance of catching you when you fall, while still being reasonably lightweight and easy to carry. 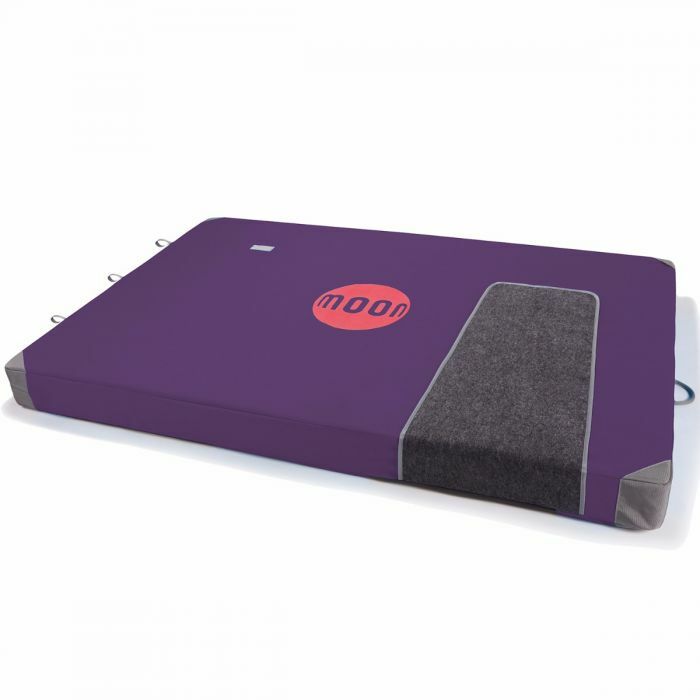 The one-piece design eliminates any fold points or empty space that you can twist your ankle in, and the non-slip base will keep the mat firmly in place. Last but not least, the Saturn features a foot wipe pad that covers the backpack straps on the top sheet so you don't trip over them while you're climbing. Genius. The Moon Saturn Crash Pad is made up of 9.5cm of open cell foam sandwiched between two sheets of 2.5cm closed cell foam for optimal protection and impact absorption properties, whatever distance you're falling from. Consider if you need a big pad. The Moon Saturn is among the best big pads for bouldering. The straps work very well, avoiding the pad to the sides perfectly. Plus, it's very confortable to carry it around with a nice backpack in it, containing anything you need for one complete day of bouldering, or even more. The clever closing below keeps your stuff inside, so that you don't drop your climbing shoes on the way. No complaint in landing in it either. It's huge, hard not to hit it, and thick enaugh for the higher projects. The "side of the ground faces inside" layout works. The all purpose of it is that you can carry the pad without getting you or your car dirty. Very clever. The only defauld I find in it is that the foams inside came inside a plastic bag that I did not took of. I eard that some climbers did it and the foam started to loose shape with time and specialy in humid consitions. That's not happening with me. So far so good, cannot complain. Definitively recommend it if you want a practical and clever big pad for some of the higher lines.